We’re going to be spending more time indoors in the coming months. What better time to learn more about our indoor environment? 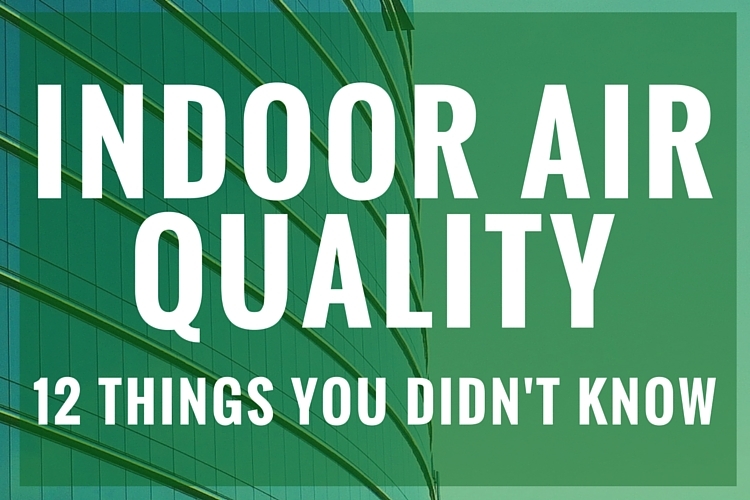 We’ve gathered some important but not-so-well-known facts about indoor air quality (IAQ) to help keep you healthy during your time inside. According to the Environmental Protection Agency (EPA), indoor environments have two to five times more pollutants than outdoor environments. In extreme cases, indoor pollutants have been recorded at levels 100 times higher. Combine all that indoor air pollution and with the fact that we spend 90 percent of our time inside and it’s no surprise that the EPA has ranked poor IAQ among the top five environmental health risks. You’re probably asking, how is that possible? Well for one, newer buildings tend to be better insulated. While that’s great for energy efficiency, it also means that buildings are not being naturally ventilated like they used to be. Instead, new buildings have to rely completely on mechanical HVAC systems for adequate air filtration and ventilation. If the HVAC system is contaminated, overloaded, or not optimized for the space, you can end up with some pretty serious IAQ problems. Secondly, new buildings tend to come with new furnishings that emit VOCs (Volatile Organic Compounds) and contaminate indoor air. One of the most common contaminants is formaldehyde, which can be found in new wood and vinyl flooring, carpets, furniture, upholstery fabrics, and paints and sealants. These products will go through a process called “off-gassing” where the chemicals are steadily emitted from the products. Off-gassing will eventually taper off as the materials age and ventilation moves the chemicals out of the space. Speaking of formaldehyde, tons of other packaged goods and beauty products also contain or emit this cancer-causing chemical. In fact, that “fresh new” smell that hits you when you get into a new car or open a new gadget comes from formaldehyde. The manufacturing, building and home furnishing industries commonly use formaldehyde for its preservative and adhesive qualities. If you’ve just moved into a newly renovated space or bought new furniture, make sure that you provide adequate ventilation in the space to help speed up off-gassing (see #2) and replace contaminated air. It may seem counterintuitive, but air fresheners don’t actually freshen indoor air at all. Instead, they add phthalates to the air. Many manufacturers use these chemicals to soften plastics and hold fragrances, even though they’re known to intensify asthma symptoms, interfere with reproductive development, and disrupt hormone function in babies and children. Other chemicals found in air fresheners an also combine with ozone gases to form harmful compounds like formaldehyde and acetone that damage respiratory health. If air fresheners are off limits, you might be thinking that candles are the way to go. But candles also emit chemicals like benzene, toluene, alkanes and alkenes. Unfortunately, those yummy, holiday-scented candles that you love so much tend to be some of the biggest offenders. If you must have your holiday scents, avoid paraffin wax and opt for soy- or beeswax-based candles made with only pure essential oils. That’s because many household cleaners contain VOCs that are emitted during both use and storage. Children, elderly adults, and people with asthma or other respiratory problems are most at risk for complications due to VOC exposure. To minimize IAQ problems, make sure you have plenty of ventilation coming though the space while you’re cleaning and that you store the cleaning products properly when you’re done. Remember, cleaning products can emit VOCs even when they’re not in use, so storing them under the kitchen sink might not be the best idea. Instead, look for manufacturers instructions on the packaging or online, and make sure the products are stored where children can’t reach them. If you’re worried about VOC-exposure in you building, school or home, you can purchase cleaning products that are free of VOCs, or use natural cleaners like white vinegar, baking soda and lemon juice. You can find more information on the EPA’s website. Printing inks, especially those used in personal printers, contain chemicals known as ethylene glycol ethers, or “glymes” that have been linked to developmental damage, birth defects, damage to reproductive organs, gene mutation, and increased blood toxicity. Children and pregnant women are most at risk, and some studies have linked glymes to miscarriages. The EPA published a new rule in 2014 to help protect consumers from glymes, but that doesn’t mean they’re not still in use. If you’re expecting or have children, try to limit your exposure to printing inks and wash your hands after using the office printer. Poor IAQ and contaminants affect children’s health and learning every day. But IAQ problems continue to be a major issue for schools across the country. Part of this has to do with the fact that schools contain so many environmental hazards that can contaminate indoor air. Mold, cleaning products, pesticides, VOCs and chemicals for art and science glasses are just a few. The risks associated with these indoor air contaminants are twofold for children. First, children’s lungs are exposed to more contaminated air in any given time period because they tend to breathe at a faster pace than adults. Second, children’s lungs are smaller and less developed than adults’ so they are more likely to experience complications from exposure to indoor air pollutants. This leaves children at risk for both short- and long-term health effects. Many of these issues could be resolved with proper ventilation, but this is hard to achieve this in schools because classrooms tend to have a high concentration of students in them at one time (compared to an office building or other facility). 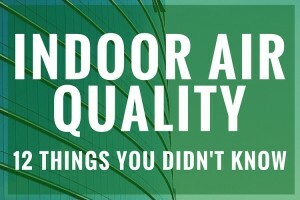 Moisture and poor IAQ can lead to costly health and comfort problems for employers. Employees exposed to poor IAQ at work can experience headaches, fatigue, nausea, increased allergy and asthma symptoms, or general discomfort that lead to lower productivity. Respiratory symptoms and illnesses can even lead to higher employee absenteeism. If fact, OSHA estimates that lowered productivity and sick leave due to poor IAQ costs U.S. employers $15 billion annually. Employee symptoms related to indoor air quality can typically be classified as one of two conditions: Building-Related Illness (BRI) or Sick Building Syndrome (SBS). Building-Related Illnesses deal with diagnosed IAQ or other facility problems that are making occupants sick, while Sick Building Syndrome deals with symptoms whose cause can’t be identified. BRI and SBS issues might not sound very serious, but their consequences are no joke. The World Health Organization estimates that up to 64 million U.S. office workers and teachers are at risk of suffering from SBS. The days will soon be short, and the nights cold, and pests will try to make their way into heated buildings and homes. What you might not know, is that the presence of pests can lead to IAQ problems, including increased allergy and asthma symptoms. Many people are unknowingly allergic to pests like mice, rats, cockroaches, and other pests, and their “by-products” (think dander, mouse droppings and urine). If you start to experience unexplainable allergy or asthma symptoms this winter, some new undercover tenants might be the cause. We don’t often think of moisture when we talk about IAQ problems. But moisture is a major cause of IAQ problems in buildings of all types. Sometimes moisture in and of itself is the problems. For instance, excess moisture in the form of humidity leads to uncomfortably heavy air that worsens asthma and allergy symptoms. More often that not, however, moisture leads to more serious IAQ problems. It’s important to remember that. The most obvious example of this is the connection between moisture and mold growth. If moisture problems are not resolved, dangerous mold and or bacterial growth can result. While most strains of mold and bacteria will just make you sick, some strains can be deadly. Moisture problems also tend to attract pests, can lead to indoor environmental quality problems due to musty smells and humidity, or lead to the breakdown of building materials that release chemicals into the air. If moisture problems go seriously unchecked, you can end up with hidden mold growth. Hidden mold is a serious problem because it can grow unseen behind walls and underneath building materials for extended periods of time. As they grow, these molds will release myotoxins, some of which are toxic enough to cause immune and nervous system damage. Occupants might feel sick, but oftentimes the problem goes unresolved because no one can find the source of the problem. To identify a hidden mold problem, you’ll have to look for non-visible clues of moisture damage and mold growth. First, pay attention to musty smells as many common strains emit microbial VOCs with this unpleasant odor. Also pay attention to increased complaints about health symptoms such as reports of coughing, wheezing, upper respiratory symptoms and increased asthma and allergy symptoms. People sensitive to mold can also experience headaches, eye irritation, nasal stuffiness, and other flu-like symptoms.